Towers of Innisfree is a site specific art installation inspired from the concept of an island, both in its physical and symbolic nature. 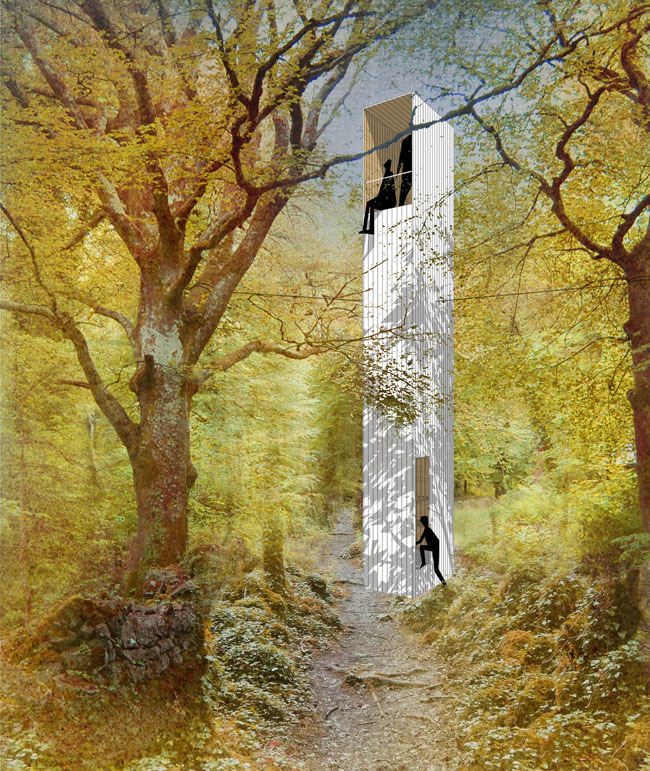 A set of towers is to be placed around the island of Innisfree, hidden between its thickets, so that only their upper part peeps out above the treetops. 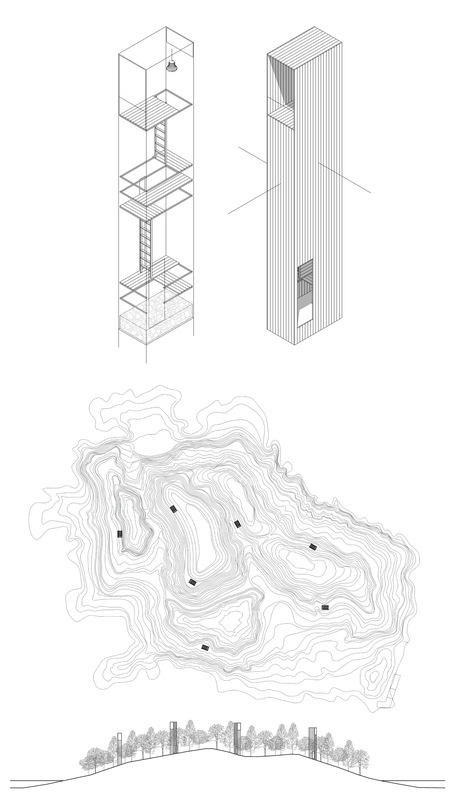 This array of towers alters the visual and physical impression of the island, from within and from the outside. It changes its skyline, offering an intriguing appearance whose composition constantly changes as you approach the island from the mainland. The experience of traveling inside the island becomes a playful act of discovery of the different towers that are scattered around it. 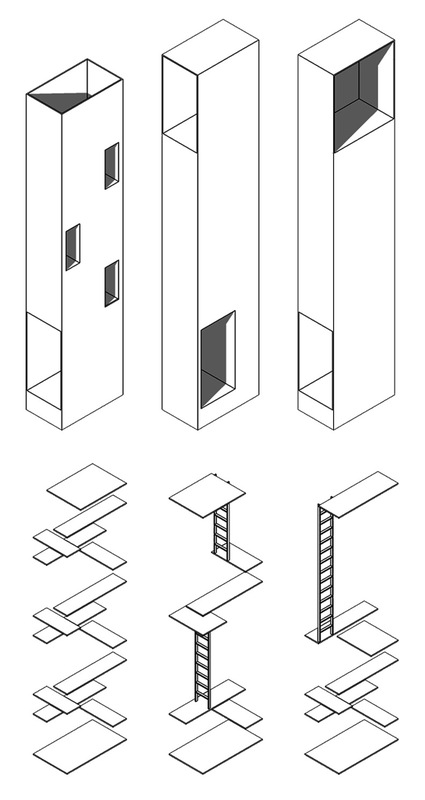 Each of the towers is designed as an individual structure both in its facades and its internal circulation and is located as an isolated object. However, when climbing up towards the upper balcony, the rest of the towers are revealed and act together as a spatial network which enables mutual communication in view and in sound. Bells that will be installed at the top balconies add a mystical effect which resembles old bell towers. These balconies are designed as an intimate place for reflection, while offering a unique panoramic view of the entire island, its boundaries and the surrounding water at a single glance. The installation offers a multilayered experience which shifts between the notions of a point and a field. That relates to the symbolism of the Island, which places in dialogue ideas of here and elsewhere; self and other; real and imaginary. These ideas are evident in Yeat’s poem, which calls for spiritual contemplation and uses the Island of Innisfree not only as a physical place but rather as an idea to aspire to. The towers, whose design is inspired from maritime lookout elements such as ships crow’s nest, are constructed from wood planks and beams, and are designed to be pre-fabricated on the mainland and installed at site. The ecological footprint is minimal and all materials are capable of being reused or returned to their origin.